Fish undertake migrations for a number of reasons including to spawn, feed and seek refuge. These migrations are also essential to ensure the dispersal of species and maintain genetic fitness within fish communities. 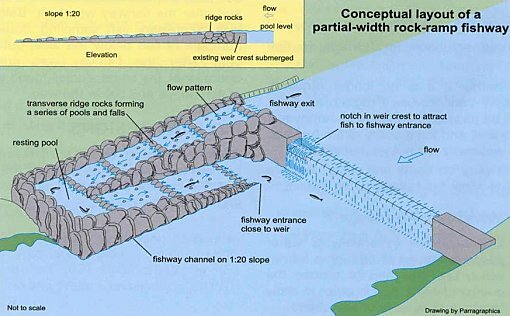 Fishways, also known as fish ladders or fish passes, are structures placed on or around constructed barriers (such as dams or weirs) to give fish the opportunity to migrate. The first written reports of fishways date to 17th century France, where bundles of branches were used to create steps in steep channels, allowing fish to bypass obstructions. Today, most fishways follow a similar basic concept, allowing fish to pass around the barrier by swimming through a series of gaps or slots that control the velocity (speed) of water. 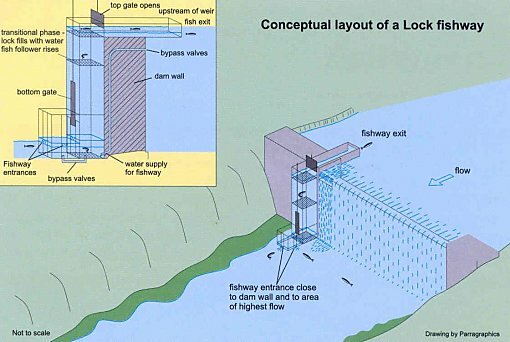 Each weir or dam on a river that is targeted for fishway construction represents a unique situation. There are many aspects that need to be considered within the design of a fishway, The species diversity and size of the migrating fish community varies from site to site. Fishways are designed to cater for the physical characteristics and swimming abilities of the prevailing fish community. Typically, the smaller species of fish are weaker swimmers and are unable to negotiate the faster flows in a fishway that larger fish can. The hydraulic conditions within a fishway need to provide both enough depth for large fish whilst ensuring the velocity is suitable for smaller fish. Pool-type fishways were the first type to be developed and consist of a series of interconnected pools bypassing an obstruction. Many different types of pool fishways have been designed in Australia, however, the vertical-slot design is the only one which has proved effective with native fish. 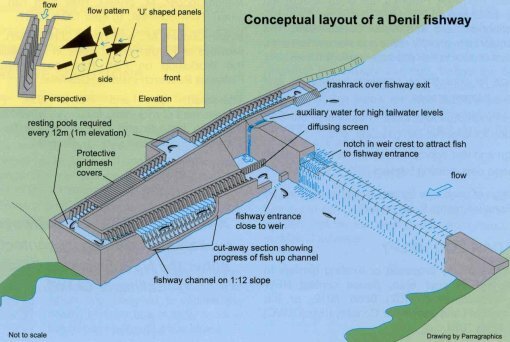 The denil fishway was developed in 1909 by a Belgian scientist, G. Denil. This style of fishway uses a series of symmetrical close-spaced baffles in a channel to redirect the flow of water, allowing fish to swim around the barrier. 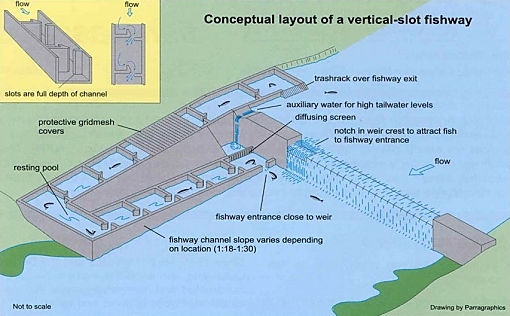 Lock fishways operate by attracting fish through an entrance similar to that of a pool-type fishway, but instead of swimming up a channel the fish accumulate in a holding area at the base of the lock. This holding area is then sealed and filled with water to reach a level equal to the water upstream of the barrier. Fish are then able to swim out of the lock. To encourage fish to move through the various attraction and exit phases of the lock cycle, a combination of attraction flows and crowding screens can be used. The frame that supports the hopper transporting fish from downstream to upstream. The hopper (highlighted by the circle). The hopper is submerged on the downstream side of the wall. Fish are attraced into it by an enhanced water flow. A trapdoor closes and the hopper makes its way up and over the wall, transporting the fish to the upstream weir pool. The structure that guides the hopper as it moves up and over the wall. On the upstream side of the wall. The orange circle shows the hopper. 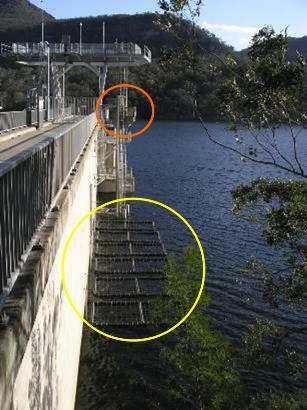 The yellow circle shows the fish protection structures. These structures provide protection from predators for the fish released from the hopper. Large rocks and timbers are used to create pools and small falls that mimic natural structures. 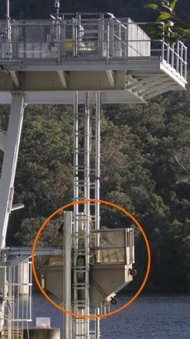 Due to the length of channel needed for the ladder, such structures are most appropriate for relatively short barriers. 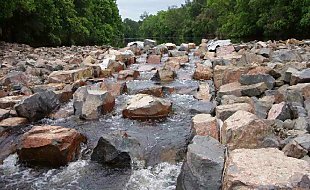 The process of constructing a rock-ramp fishway is illustrated by the example of the Stroud Weir fishway, on the Karuah River. (Note: this page contains lots of photographs and may take a while to load). Bypass fishways are low-gradient earthen or rocky channels that mimic the structure of natural streams and are often described as ‘nature-like’ fishways. 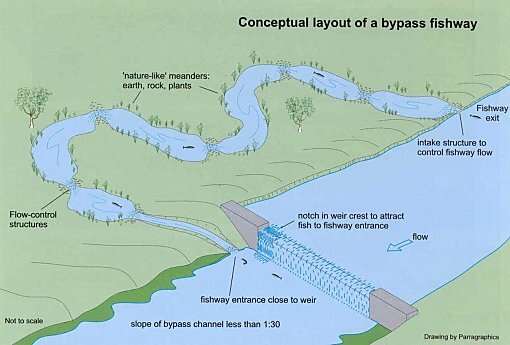 Some flood bypass channels have been built or occur naturally, but no bypass fishways have yet been built in Australia. Their use is being considered by NSW DPI because they may provide a cheaper alternative to the more technical fishway designs. A number of other fishway types have been developed to provide fish passage in situations where the above fishways are inappropriate. These include the elver pass: generally a small-diameter pipe or channel lined with materials such as coarse brushes that provide migrating juvenile eels with a damp, complex surface over which to wriggle (Mitchell 1990; Clay 1995). An elver pass is presently being designed for Warragamba Dam. The creation of a rock ramp fishway on Turella Weir at Wolli Creek means fish can now access more upstream habitat: an important improvement in this inner Sydney area. Wolli Creek is a tributary of the Cooks River, which flows through Sydney into Botany Bay. The weir and causeway were built in the early 1900s to provide access and water for adjacent Chinese market gardens. Turella Reserve and Wolli Creek Regional Park have now replaced the old market gardens, meaning the weir no longer serves its original purpose but still prevents fish from moving up- and downstream for most of the time. This project is part of the forner Sydney Metropolitan Catchment Management Authority’s (now Local Land Services) ‘Cooks River Urban Water Initiative’ which is rehabilitating the Wolli Creek environment by controlling weeds, replanting these areas with native plants and cleaning up stormwater before it flows into the creek. Industry and Investment NSW (Fisheries), Rockdale and Canterbury City Councils partnered the former Sydney Metropolitan CMA to undertake the fishway works and were supported by the Wolli Creek Preservation Society. NSW DPI has a Memorandum of Understanding (MOU) with State Water Corporation to provide technical advice on fish passage improvements and other aquatic habitat issues. The MOU requires DPI to provide all necessary fish passage advice associated with the structural upgrades and fishway related works at State Water’s dams, weirs and regulators in NSW. State Water Corporation has constructed 6 fishways at Warren Weir, Guningbar Creek, Duck Creek, Crooked Creek, Bumbuggan Creek and Island Creek. A rock ramp fishway will be constructed at Brewarrina Weir to enable fish species including Murray cod, golden perch and silver perch to migrate in the Darling River. Under low-flow conditions the low-flow fishway will direct the river through its historic channel, aiding in the rehabilitation and restoration of the Ngunnhu. NSW DPI is working on this important project with the community and many partners including State Water, Land Council, Brewarrina Community Development and Employment Program, Ngemba and Murrawarri elders and community leaders, Brewarrina Senior Citizens Association, Brewarrina Chamber of Commerce, the Royal Hotel Fishing Club and all licensed users of the weir pool. In conjunction with the Murray Darling Basin Commission and state agencies from Victoria and South Australia, NSW DPI is assisting with the construction of 12 fishways along the length of the Murray River to restore connectivity between Lake Hume (near Albury) and the sea. Recently vertical-slot fishway have been constructed at Lock 7, Lock 8, Lock 9 and Lock 10 on the Murray River. NSW DPI scientists are assisting in monitoring fish migrations through these new fishways. An experimental manual fishway at Balranald Weir has been constructed and in the first four weeks almost 8,000 fish were observed using the fishway. NSW DPI and Balranald Shire Council have now successfully sought funds from the Environmental Trust to automate the fishway to provide permanent benefits to the ecology of the Lower Murrumbidgee River. Hunter Water Corporation in partnership with NSW DPI and the Department of Infrastructure, Planning and Natural Resources completed the construction of a full-width rock ramp fishway at Bandon Grove on the Williams River. The hopper (highlighted by the circle) is submerged on the downstream side of the wall. Fish are attracted into it by an enhanced water flow. A trapdoor closes and the hopper makes its way up and over the wall, transporting the fish into Lake Yarrunga. Industry & Investment NSW and Local Land Services are conducting a study to investigate and minimise the impacts of Tallowa Dam on fish communities in the Shoalhaven River. Previous studies have shown that fish assemblages upstream and downstream of the dam differed significantly. This included the accumulation of large numbers of fish immediately downstream of the dam, as well as the localised extinction of migratory native fish in the upstream reaches of the Shoalhaven River. In 2009, a high dam fishway was constructed at Tallowa Dam to allow for the upstream migration of fish into Lake Yarrunga and its upstream tributaries. Monitoring upstream and downstream fish assemblages to determine any subsequent redistribution of fish following fishway construction. A tagging program to enable migratory fish to be tracked via automated tag reading systems through the fishway. Direct trapping of the fishway will be done to determine the total number of fish completing migrations. Assessing the survivability of catadromous fish passing downstream over a high dam spillway.